At the invitation of Dmitry Rogozin, Deputy Prime Minister of Russia, and Yury Trutnev, Deputy Prime Minister and Presidential Plenipotentiary Envoy to the Far Eastern Federal District of Russia, Vice Premier of the State Council of the People's Republic of China Wang Yang will travel to Russia from September 4 to 8 to host the Chairmen's Meeting of the Committee of the China-Russia Prime Ministers' Regular Meeting, attend the 3rd Eastern Economic Forum, and hold the 1st meeting of the Intergovernmental Commission for Cooperation of the Northeast China and the Far East and Baikal Region of Russia. Q: We have learned that on the afternoon of August 28, the Indian border troops and equipment that illegal crossed the Sikkim sector of the China-India border have all been withdrawn to the Indian side, marking an end to the trespassing incident. Do you have more information? A: On June 18, the Indian border troops illegally crossed the well-delimited China-India border in the Sikkim Sector into China's Dong Lang area. 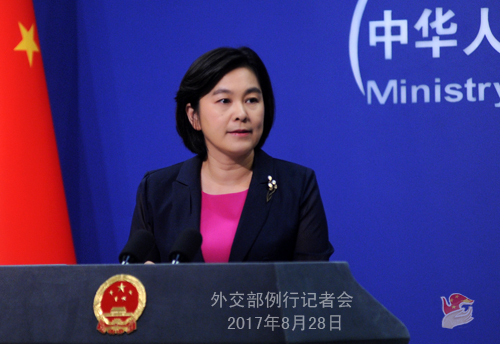 China has lodged representations with the Indian side many times through diplomatic channels, made the facts and truth of this situation known to the international community, clarified China's solemn position and explicit demands, and urged India to immediately pull back its border troops to the India's side. 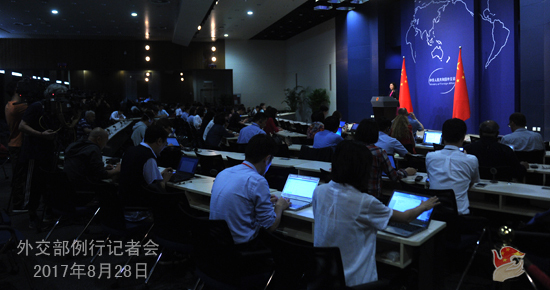 In the meantime, the Chinese military has taken effective countermeasures to ensure the territorial sovereignty and legitimate rights and interests of the state. At about 2:30 p.m. of August 28, the Indian side withdrew all its border personnel and equipment that were illegally on the Chinese territory to the Indian side. The Chinese personnel onsite have verified this situation. China will continue fulfilling its sovereign rights to safeguard territorial sovereignty in compliance with the stipulations of the border-related historical treaty. The Chinese government attaches importance to developing good neighborly and friendly relations with India. We hope that India could earnestly honor the border-related historical treaty as well as the basic principles of international law and work with China to preserve peace and stability in the border area and promote the sound development of bilateral relations on the basis of mutual respect for each other's territorial sovereignty. Q: It is reported that on August 26, the DPRK fired three short-range projectiles into the eastern waters off the Korean Peninsula. China has been urging the DPRK to stop launching activities, so how do you comment on this latest move by the DPRK? A: The situation on the Korean Peninsula at the moment is very complex and sensitive. All relevant parties shall exercise restraint, refrain from provoking each other and heightening tensions, and make joint efforts to ensure peace and stability on the Korean Peninsula. The suspension-for-suspension proposal and the dual-track approach raised by China gives a balanced consideration to the legitimate security concerns of all sides and represents a practical and feasible way to properly settle the Korean Peninsula issue. We hope that relevant parties could respond positively and work with China to seek an effective way out of the Korean Peninsula issue. Q: Can you confirm that the Indian personnel have already left or they are in the process of leaving? A: I am pleased to confirm that the Indian border personnel and equipment have all been withdrawn to the Indian side of the border. Q: The Indian government's announcement is that there is a "mutual disengagement" of the troops between the two countries. You haven't mentioned the pullback of the Chinese troops. You mentioned only the pullback of the Indian troops. How do you explain? A: The Chinese side has made it clear that the Indian border personnel and equipment that trespassed into China's territory have all been withdrawn to the Indian side of the border. The Chinese border troops continue with their patrols and stationing in the Dong Lang area. China will continue with its exercise of sovereign rights to protect territorial sovereignty in accordance with the stipulations of the border-related historical treaty. Q: The US imposed financial sanctions on Venezuela on August 25, prohibiting US citizens or an individual or entity within the US from buying some new short-term bonds as well as previously-issued bonds by the government of Venezuela and its state oil company. Equity trading is also prohibited with the Government of Venezuela as well as any entity owned or controlled, directly or indirectly, by the Government of Venezuela. What is your comment? A: We have noted relevant reports. 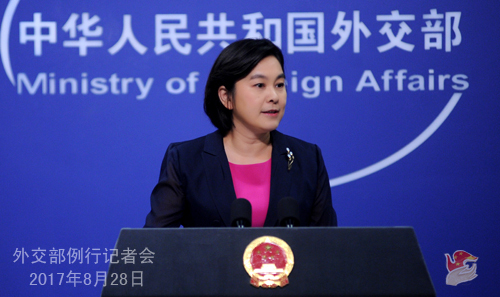 China always advocates the principle of respect for other countries' sovereignty and independence and non-interference in other countries' domestic affairs. The issue arisen in Venezuela shall be independently resolved by the Venezuelan government and people. The past experience has shown that external interference or unilateral sanctions will only complicate the situation and help in no way resolve the practical problem. Q: There are some press reports saying that several Venezuelan high-ranking officials are now in China trying to obtain more financial support from China. Can you confirm it? A: I am not aware of what you said. We have been following the situation inside Venezuela, and we believe that the issue of Venezuela shall be worked out independently by the Venezuelan government and people. China maintains friendly and cooperative relations with a majority of the Latin American countries, including Venezuela, on the basis of mutual respect, equality, mutual benefit, and win-win cooperation. Financial institutions and corporations from the two sides carry out cooperation in accordance with commercial principles. We hope that Venezuela and other Latin American countries could maintain stability and development. Q: The Indian side said that it is a "mutual disengagement". Do you agree with that? A: What I want to stress is that the Indian side withdrew all its border personnel and equipment that were illegally on the Chinese territory to the Indian side. The Chinese personnel onsite have verified this situation. The Chinese border troops continue with their patrols and stationing in the Dong Lang area. China will continue fulfilling its sovereign rights to safeguard territorial sovereignty in compliance with the stipulations of the border-related historical treaty. In the meantime, in light of the changing landscape on the ground, China will make necessary adjustments and deployment as it sees fit. Q: According to the Kyodo News, the follow-up meeting of the Tokyo International Conference on Africa Development (TICAD) Ministerial Meeting wrapped up on August 25 with the adoption of a chair's statement in which the foreign ministers of Japan and African countries stressed the importance of adhering to maritime rules based on international law. The Japanese Foreign Minister said at the meeting that the preservation of maritime order on the basis of the principles of international law, including navigation freedom, is the prerequisite for world peace, stability and prosperity. What is your response? A: As far as we know, the aforementioned press report and the statements by the Japanese Foreign Minister severely deviate from the facts. The follow-up meeting of the TICAD Ministerial Meeting never passed the so-called chair's statement. It only reflected what's transpired amid discussions in a conference minutes. The maritime-related contents, completely and unilaterally cooked up by the Japanese side, got no endorsement from any African countries. In fact, many African countries have spoken out against those contents. The Foreign Minister of Mozambique, the host country of the follow-up meeting of the TICAD Ministerial Meeting, while jointly meeting the press with the Japanese Foreign Minister, said that TICAD, as a platform to discuss development and cooperation, shall not be politicized, and stressed that the maritime-related contents are only applied to the Atlantic Ocean and the Indian Ocean. I want to stress that TICAD is a venue for multilateral exchanges and cooperation on African development. African countries expect this meeting to play its due role in supporting Africa's development and oppose politicizing TICAD. We welcome greater attention and input to Africa from the international community. We also hope that when promoting Africa's development, Japan could show its utmost respect for African countries and extend its help with heartfelt sincerity. It should not impose its wills on Africa or attempt to drive a wedge between African countries and others. Q: You said that India has unilaterally pulled back from the Dong Lang area, as was asked by the Chinese side. Then you said that the Chinese side will make adjustments accordingly. Could you clarify what do you mean by that? A: I have made myself very clear. In light of the changes on the ground, China will accordingly make necessary adjustments and deployment. I also stressed that the Chinese border troops will continue fulfilling the sovereignty rights to safeguard territorial sovereignty in compliance with the stipulations of the border-related historical treaty. Q: Do you mean that the standoff has been amicably settled between the two countries after India's withdrawal? A: The Indian side has withdrawn all its trespassing border personnel and equipment to the Indian side. The Chinese personnel onsite have verified this situation. China will continue fulfilling its sovereign rights to safeguard territorial sovereignty in compliance with the stipulations of the border-related historical treaty. In light of the changes on the ground, China will accordingly make necessary adjustments and deployment. We believe that it serves the interests of China and India to resolve this incident peacefully via diplomatic means. It also demonstrates China's sincerity and attitude in preserving regional peace and stability as a responsible major country. The Chinese government values its good neighborly and friendly relations with India. We hope that India could earnestly abide by the border-related historical treaty and basic norms of international law and work with China to ensure peace and stability in the border area on the basis of mutual respect for each other's territorial sovereignty, and to promote the healthy development of bilateral relations. Q: In Ecuador, a crew of Chinese fishermen were sentenced to jail for illegal fishing in the Galápagos Islands, which was followed by several demonstrations in that country against Chinese fishermen. Ecuador is a very good friend of China. Has the Ministry been in contact with Ecuador? A: China has noted the relevant situation. We've said many times that the Chinese government opposes all forms of illegal fishing. On the issue of protecting endangered wildlife, the Chinese government adopts a zero-tolerance attitude towards illegal trading in endangered wildlife and the products derived from them. The Chinese government always instructs its fishing businesses to operate in accordance with laws and regulations and protect the marine eco-environment. China believes that relevant departments in Ecuador will deal with this case in accordance with law and guarantee the lawful rights and interests of the Chinese personnel and enterprises.